The French President and the Minister of Foreign Affairs have appointed Philippe Létrilliart as Extraordinary and Plenipotentiary Ambassador of the French Republic in Nicaragua. M. Létrilliart previously served as the Consul General of France in Miami and as a member of CRI's Community Advisory Board. 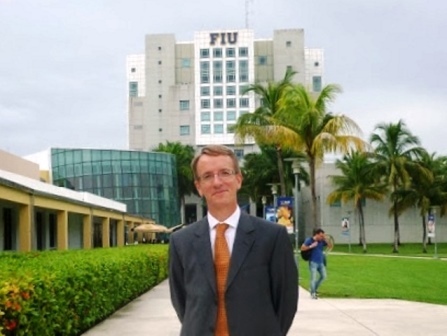 Before assuming office in Miami, Philippe Létrilliart was Head of the Department in charge of Mexico, Central America, and the Caribbean at the French Ministry of Foreign Affairs (2010–2013). He began his professional stay abroad as a coopérant in Guatemala (1989–1990), before joining the French Ministry of Foreign Affairs. He subsequently held the position of First Secretary at the Embassy of France in Havana (1996–2000). He also served as the Senior Advisor to the Embassy of France in La Paz (2006–2010). As part of the Center for Research and International Studies, M. Létrilliart was a Senior lecturer at the Institut d'Etudes Politiques de Paris (Sciences-Po) (2003–2006). He is the author of the books Les Amériques du milieu: Amérique centrale et Caraïbes entre fragmentation des nations et ambitions régionales (2015) and Cuba, l'Eglise et la Révolution [Cuba, the Church, and the Revolution] (2005); and editor of a special issue of the journal Problèmes d'Amérique Latine, devoted to "Miami, Crossroads of the Americas" (2016). Born in 1963 in Casablanca, Philippe Létrilliart graduated from the Institut d'Etudes Politiques de Paris and holds a Master of Contemporary History. We wish M. Létrilliart the best as he assumes his new diplomatic post in Managua.